Along the westbound lanes of US 460, where US 219 branches off towards West Virginia. Photo by Adam Froehlig, taken July 23, 2002. This view is from US 219 itself, coming out of the center of Rich Creek. Photo by Adam Froehlig, taken late November, 1999. 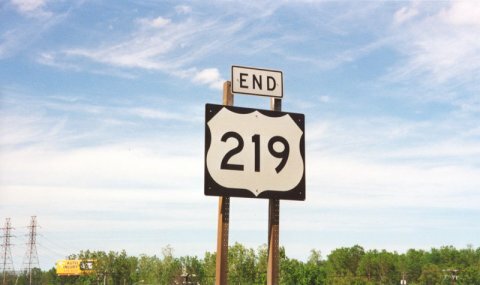 This end shield is on northbound US 219 just prior to the merge onto I-90. Photo by Alex Nitzman.